3 oz Chopped smoked Andouille OR other sausage 3 oz. Melt butter and/or vegetable oil in large cast iron skillet or dutch oven pan over medium high heat. Add chicken breasts and andouille sausage slices and cook for 5-6 minutes, stirring occasionally so all sides are lightly browned and the chicken is cooked through. Remove from pan and set aside. Lower heat to medium and add 1/3 of the onions and cook until brown. Then add the Tasso or chopped ham or bacon and cook for 2 more minutes. Then add 1/3 of the bell peppers and 1/3 of the celery. Stir Constantly so the bottom does not burn. Add some of the creole seasoning and cook for 7-8 minutes or until vegetables soften. Add tomato paste, 1/3 of the chicken stock, some of the creole seasoning, bay leaves and a shot of Tabasco hot sauce. Cook for 5 minutes then add chicken and sausage back to pan and warm. Then add more but not all onion, celery and bell pepper. Add more creole seasoning. Add the garlic and more but not all of the stock as needed and cook for another few minutes scraping and stirring the bottom. Then add chopped tomatoes and cook another five minutes along with the rest of the vegetables, seasoning and more stock , including parsley and 1/2 of the green onions. Add the shrimp and cook til pink. Taste and add kosher salt if needed. Garnish with more green onions if not baking with rice. 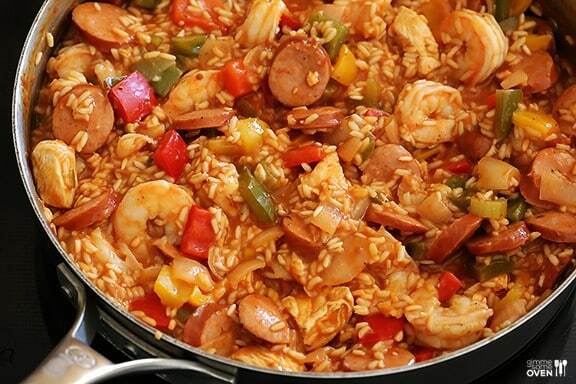 Put in a baking dish or use the same cast iron skillet and cover with rice. If the rice is made separately you can simply place on the rice and stir. If baking, cover and bake at 350 for 20-30 minutes or until the rice is barely done.